Yet the movie succeeds spectacularly in adapting a comic to the cinematic screen, a task thought impossible for decades. Indeed, M&F goes much farther in depicting Spain’s historical background than the comic book itself. In fact, there is little historical context in the comic books themselves. M&F creates that context, presenting the viewer a southern European authoritarian regime ruled by an autocratic and megalomaniac old dictator in military uniform - a man who in many ways resembles Francisco Franco. When the fictional dictator becomes a key figure in the film - he acts as a powerful antagonist to the heroes (and is the secret father of one of them) -, his portrayal becomes an allegory of the Franco regime, one that clearly marks its territory in the present discourses surrounding the debate on historical narratives and memory. Scene from "Mortadilo y Filemón"
Since Franco’s death in November 1975, the man, his Civil War, and his regime have been a major topic in well over a hundred Spanish movies that deal with a diverse set of motifs and discourses. While the 1980s and early 1990s were productive in delivering interesting visions of Francoism on the screen, Spanish cinema really broke its “sound barrier” as a prosperous cultural industry in the mid-1990s. From this point onward, new and more popular subjects became the focus of the industry’s attention, intended mainly for a younger audience that had come of age in the new democracy. The number of cinema goers doubled, creating an industry somewhat more independent from state subsidies. Yet in these years, Francoism as a cinematic subject seemed to fall out of favor. From the year 2000 on, however, it is possible - and necessary - to speak of a revival of both a renewed interest in “Francoism” as well as of a retroactive “Anti-Francoism” after Franco. A whole avalanche of journalistic and academic publications on Francoist matters have appeared in the last five years, bringing to light some of the less well known or forgotten topics related to Francoism such as forced labour, mass graves, and post-war repression.4 No doubt sensationalism and marketing playing a part in it, as with most cultural productions, but it is also true that a thorough coming to terms with the dictatorial past was avoided during the transition to democracy between 1975 and 1978.5 The new interest in Francoism, however, was not only retroactive, it also played on contemporary political controversies. In its second term of government (2000-2004), Prime Minister José María Aznar and his way of resolving government affairs were, on many occasions, referred to as “Francoist” by speakers of the main opposition parties and by members of the cultural intelligentsia. A debate over remaining Francoist symbols - mostly monuments and street names - quickly ensued. Topics such as “mass graves” and “concentration camps”, which Spaniards thought of as belonging to other political and chronological constellations (mainly to that of World War II), reached the public through the press or the television news.6 On television, a successful original soap opera dealing with late Francoism, “Cuéntame”, became a hit between 1999 and 2002. Francoism was suddenly on the spot again. The rather defective Geschichtskultur on Francoism of the previous decades was reactivated as if Spanish democracy needed a “second round” to win the play against its uncomfortable dictatorial past. Indeed, it was as if the Francoist past had not successfully been mastered the first time around, during the transition to democracy of 1975-1978 (Transición) and in the early 1980s. Among other types of media, Spanish cinema began to reflect this trend from 1999 onwards, getting back to the Civil War and Francoism as cinematic topics. The bulk of the Spanish cinema on Franco and Francoism is and has always been condemnatory, not reflexive or exploratory - including the new productions of the period 1999-2004. This is not a new feature in Spanish cinema. Many post-Civil-War productions (1940-1955) exclusively supported strong Francoist visions, and so post-Francoist cinema principally aimed at doing what had not been possible during the dictatorship: condemning Franco and upgrading his foes to martyrs and heroes - partly because most Spanish directors of the 1960s-1990s (Bardem, Saura, Aranda, etc.) had been leftist opposition figures under Franco. This is nothing but a “pendulum” movement in Spanish cinema history: from Francoism to Anti-Francoism, passing by the apolitical and naive comédie légère of the “miraculous” 1960s. All in all, however, this should be no excuse for post-Francoist cinema having avoided reflection upon and exploration of the dictatorial past in favour of its many stereotypes of good-hearted “democratic” freedom-martyrs and ruthless fascist beasts. Post-Francoist cinema has, indeed, played a good part in making Francoism into the abhorrent “dark middle ages” of Spanish contemporary culture. In many ways M&F is an exception, along with a few other films. It presents a very anti-Francoist vision of Francoism, but all of its other features are removed from its cultural and cinematic context: First, while it delivers an interesting historical narrative in the form of an allegory and parody, it is not what could be called a “historical film”. It does not intend to be historically or politically correct, nor right or wrong, but to offer a very unique historical interpretation that does not alienate the foe (Franco) but criticizes him and his regime by uncovering some of its worst features like corruption and paternalist mass-direction. Secondly, its historical narrative is packed into the form of a crazy and histrionic comedy - indeed, a comic - thus avoiding forms of representation based on cathartic confrontation of good and evil and allowing a more critical view of the parodied dictator and his regime. The fact that the viewer is forced to laugh at the heroes as well as at the comedic “Franco” allows a critical representation of the latter without dehumanizing him or degrading him into a morally inferior character. Thirdly, while being corrosively critical in its style and its visually and textually condensed depictions of Franco and his regime, it is not overtly partisan. It is a bright vision of the dark face that is considered the “best” period of Francoism - the 1960s - of its own form of chauvinistic and manipulative populism, its “propagandistic” apoliticization and its corruption. Unfortunately, M&F is not likely to expand its success far beyond Spanish borders. Among other reasons concerning European film distribution, both the comic book series and the motion picture are the products of a genuine Spanish humour, which has something of a quasi-hermetic character and is hardly susceptible to inter-cultural comprehension. There is indeed a moving picture tradition of laughing at the dictator and its regime, combining parody, allegory, farce, ridicule and other comedy elements to achieve a perfect mix of irresistible laughter, biography and sharp criticism. Laughing at the bad authoritarian guy on the silver screen reached its peak with Chaplin’s “The Great Dictator” or with Lubitsch’s “To be or not to be”. This biographical tradition merges with that of the authoritarian or nazi clown. As in a kind of present-day Commedia dell’Arte, the stereotype of the poor authoritarian clown has been established by such important paradigms like the TV nazi-clowns of “Hogan’s Heroes” and of its somewhat less known British counterpart of the 1980s “Allo Allo”.7 Both traditions are well represented in the Spanish cinema after 1975.8 This productive parody element of the “authoritarian man in uniform” is very often found wherever a German Nazi, an Italian fascist or a Spanish Falangist appear in a movie other than an epic-drama or a tragedy. Some perfect Spanish examples are the Carlist-uniform guy of “Belle Epoque” (Fernando Trueba, 1992) or the Falange official of “Los años bárbaros” (Fernando Colomo, 1998). However, M&F does more than just laugh at the naïve Nazi-clown or at Franco himself. Chaplin’s Hinkel was just a parody of an Adolf Hitler whose manners were accentuated, but Hinkel in no way interpreted Hitler’s historical significance. He was just a puppet, a new harlequin-like Capitano intended to ridicule the Nazi Führer and to deliver a pacifist speech at the end of the feature that sounded like the morale of a comedy tale. In contrast, M&F tells us a great deal about Franco and his regime in a very condensed form; whether historically right or not, invented or not, it is distilled as historical interpretation and narrative, and allegorically packed for the consumption of the average Spanish cinema goer. To see this, we must have a look into the movie. 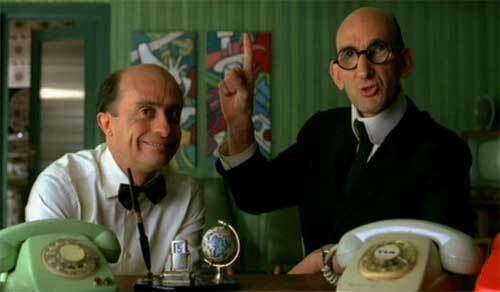 The plot behind M&F is simple: Mortadelo and Filemón are two professed “secret” agents of the T.I.A., the fictional Spanish counterpart of the C.I.A. The cartoon heroes are a couple of slapstick trouble-makers who generally botch every job in cataclysmic dimensions. And, of course, they must save the world: first from themselves and - more importantly - from the greed of an old supreme dictator, the absolute and ruthless ruler of Tirania. This country of no precise geographical coordinates, but neighbouring early 1960s Spain, is enclosed behind Balkan-like mountains and guarded by soldiers in pointed Prussian-like helmets. It is populated by masses of apolitically enthusiastic supporters in blue-workers uniform who rally before a very familiar royal palace (resembling the one in Madrid before which Franco had his most propagandistic mass rallies organized). This Tirania of enthusiastic and blissful dictatorship is only removed from Spain by a border pass, accessible by regular bus line. But, above all, Tirania is unmistakably identified as the Spain by its dictator. Scene from "Mortadelo y Filemón"
The ruler of Tirania is an old martial dictator in military gala uniform whose voice shows the same characteristic feature of Franco’s: a distinct, almost ridiculous whistle voice. Also, the movie dictator systematically makes grammatical mistakes involving pronouns, much as Gallegan speakers (Galicians) are thought to do when speaking Spanish.9 So the fictional dictator must be a Gallegan like Franco himself. The dictator has mass rallies organized in his support in front of a palace showing many similarities with the Madrid Royal Palace, as real Franco did. There, the dictatorship-loving masses are driven to ecstasy by the dictator’s personal charisma, by his paternalist speeches, and by some sociological-propagandistic engineering in a form of populist mass manipulation. Thus, M&F provides us with a perfect parody-example of the charismatic and traditional authoritarian regimes as defined by Juan Linz.10 As to his government tasks, Tirania’s dictator has two main worries, the first being the real estate business in a country that he seems to consider his personal property and the second one being his successor - hence, two of the main features of late Francoism. The critic of the so called Developmentalism period of 1959-1975 (as opposed to the long post-war autarchy of 1940-1959) is of central importance here. The official propaganda of late Francoism made peace, prosperity and order - as opposed to war, anarchy and licentiousness - the central principles of its regime (“25 Years of Peace” was the motto of its greatest campaign in 1964). In fact, the modernization and growth of the 1960s is today the only positive aspect of Francoism widely remembered or claimed. M&F attacks this conception by opposing its historically dark side: a corrupted regime whose faux-nationalism and populism are just rhetorical. Both the regime’s corruption and the success of developmentalism (which, like every economic policy, is not exempt of justified criticism) are historically true, but the movie poses an interesting question: Was the ruler or only his regime corrupt? In the light of a corrupted regime, is the highest ruler himself not the chief of all corruption? If not, is he not the least bit responsible for it? If every parody consists of degradation, M&F degrades Franco to a big thief, but more as a symbol of his regime than as an individual. 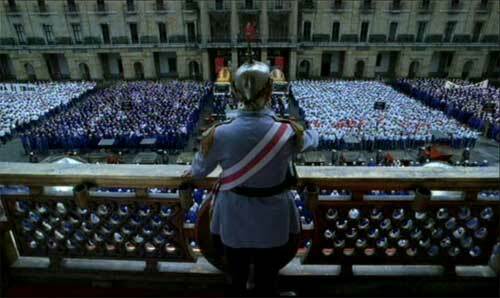 A similar example is offered by the comedy “El Oro de Moscú” (Jesús Bonilla, 2003), in which a nostalgic Francoist supporter finds out that Spain’s gold reserves, the world’s fourth largest, were not shipped by the Spanish Popular Front to Stalin but remained in Spain (this is historically not true),11 where Franco made use of them to build public infrastructures and to pay himself a more than notable salary. While historiography does not seem to support the tale of the big thief in the case of Franco himself, “El Oro de Moscú”, without its otherwise sound historical foundation, challenges the biographical figure of Franco as an individual (represented in the movie through a portrait of the real Franco, not through parody), thus coining a negative myth of Franco himself as a thief. On the contrary, M&F contributes in demystifying the dictator by attacking the narrative that portrays him as impellor of development and modernization. Because this parody of Franco acts as a symbol and its depiction as an allegory, the whole regime is challenged, even when the fictional Franco takes with him a suitcase full of greenbacks and leaves the palace with the feeling of having done a “good job”, leaving everything in his country “atado y bien atado” (“everything fixed and well fixed”), as it is said today of the departure of the actual Franco. The succession issue is a more difficult matter. Tirania’s strong man has no heir - or he thinks so until he finds out that one of the heroes, of whom we are never sure who is the dumbest, is revealed as his actual son. Because a complete idiot and the second most stupid man in Spanish comic book history eventually becomes the successor to the fictional Franco, this might be a kind of criticism hidden between the lines. But as Spain’s Monarchy pretends not to be the varieté motif of its British counterpart, we should make no further suppositions at this point. The film ends showing that in many ways Tirania will remain Tirania despite the dictator’s departure. Everything seems to change, but nothing is really going to change. The movie seems to prefer the continuation of the Banana Republic of Tirania under new rulers, whatever the political form might be. This “Banana-Republicanism”, despite the scandals of the ruling Spanish Socialist Workers Party (PSOE) of the early 1990s and the major identity complex of the Spaniards, is neither a central feature of Spanish history nor a Spanish trademark. Not even of Francoism itself, as some “Banana-Republicanism” hides somewhere at the underground level of all Western democracies. Attached to this narrative is the complex problem of the “exceptional feeling” of extra-Europeanness that ravaged Spain during the Franco years. Despite Developmentalism and a kind of “Glasnost” in the 1960s (“apertura”, opening), it is true that, to a certain extent, Franco’s Spain was and is rightly seen as extra-European in its socio-political context: Western and capitalistic but not democratic. The ambiguous and jingoistic motto “Spain is different”, greatly induced by Francoist propaganda itself, proved to be a major source of misunderstandings, false stereotypes and identity handicaps both inside and outside Spain. It is in this sense that the Banana Republic of Tirania becomes a much clearer image and a very intelligent one. Indeed, Franco’s Spain of Tirania is not even really nationalist in a proper sense but rather extra-European and a little Balkan-like, speculation-driven and - above all - nepotistic, autocratic and populist. This is much nearer to the historical truth than the tale of the Fascist Spain, which is only justified - to a lesser extent - for the period 1940-1943, but is still believed and argued by some actors of the Spanish public. Even more accurately, the Spain of M&F has a lot of that “Spain of bullfighters and Flamenco dancers” (“la España de charanga y pandereta”) that Spanish poet Antonio Machado had condemned in his very famous poem “El Mañana Efímero”12 in accordance with the Regeneracionistas, the Generation of 1898, and thinkers such as Ortega y Gasset. In my opinion, this is not only a correct interpretation, but also a narrative that has been traditionally neglected in the Spanish cinema after 1975 in favour of other narratives that exclusively dealt with Francoism through the cathartic treatment of the Civil War and did not attempt any incursion in the subsequent 40 years of Francoist rule, especially in the last two decades. It is to this point that “Mortadelo y Filemón” tells more than the adventures of its heroes, offering a vision of the Franco regime that never really became a new great Empire of Spanishness, nor “Europe’s last Christian reserve”, nor the Spain of “labour and bread” dreamt by the idealistic sectors of the regime in its origins. It is just another failure in the attempt of regeneration pursued since 1812 and 1898, this time in the form of a decadent authoritarian regime - presided over by a senior dictator, ruled by corrupt political elites, and disguised as a populist dictatorial show of bullfighters and Flamenco dancers. 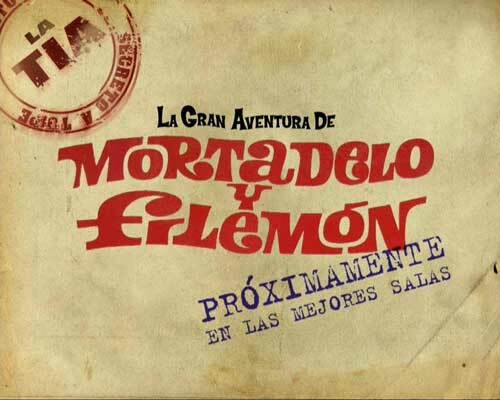 1 La Gran Aventura de Mortadelo y Filemón (“The Great Adventure of Mortadelo and Filemón”), commonly shortened to “Mortadelo y Filemón”, is a production of Peliculas Pendelton S.A. and Sociedad General de Cine S.A., with financial support by Telecinco S.A. and Canal+ España. It was produced by Luis Mansó and directed by Javier Fasser. The movie opened nationally in Spain on February 7th, 2003.- The Author would like to thank Peliculas Pendelton S.A. and especially Mr. Luis Mansó, producer of “Mortadelo y Filemón”, for authorizing the reproduction of the video and audio cuts belonging to the motion picture that are available with the electronic version of this article. 2 The Creator of Mortadelo and Filemón is the Spanish cartoonist Francisco Ibáñez, born in Barcelona in 1936. Since 1958, when Mortadelo and Filemón made their first appearance in a comic book, Ibañez has produced more than 150 issues. Until 1985 they were published by the Bruguera publishing house and, from 1988 to the present day, by Ediciones B. More than 150 million issues of Mortadelo and Filemón have thus far been sold, making the series the Spanish counterpart of the classical French Tintin and Asterix comic book series. 3 Since its opening in February 2003, circa 5,000,000 people have viewed the film, an outstanding number even for the most successful Spanish and/or European film productions. M&F has become the most successful Spanish film ever shown (measured by its popularity). Source: Base de datos de películas, Ministerio de Cultura. 4 It is impossible even to quote a representative minority of the new publications, both serious and sensationalistic, that have appeared in these years. A perfect example of using history for the sake of journalistic sensationalism is the article “Hubo un holocausto español?” (“Was there a Spanish Holocaust?”), by journalists Montse Armengó and Ricard Bellis, published in the magazine of popular history Clio, revista de historia, 33, July 2004, pp. 68-73. Not only are statistics of Francoist repression in this article well inflated - but its authors claim that Civil War killings by Francoist troops should be considered “genocide” or “holocaust” and renamed accordingly. 5 For a short introduction to the problems of post-dictatorial remembering and Francoism as a current affair in Spain see David Rey, Erinnern und Vergessen im post-diktatorischen Spanien, in: Martin Sabrow/Ralph Jessen/Klaus Große Kracht (Hg. ), Zeitgeschichte als Streitgeschichte. Große Kontroversen seit 1945, München 2003, pp. 347-369. 7 The American TV series “Hogan’s Heroes” was broadcasted nationally on CBS from 1965 to 1975, accounting ca. 168 episodes. The nazi clowns were Col. Klink and Sgt. Schultz. The European counterpart was “Allo Allo”, broadcasted on BBC1 from 1988 to 1992. Its major nazi clowns were Col. von Strohm, Cpt. Geering, Herr Flick and von Smallhausen. 8 To name some examples of parodies of the Civil War, of the Franco years or of Franco himself: “Biba la Banda” (Ricardo Palacio, 1987), “El Vaquilla” (L. Garcia Berlanga, 1985), “El Año de las Luces” (Fernando Trueba, 1986), “Gracias por la propina” (Francesco Bellmunt, 1997), and “Espérame en el cielo” (Antonio Mercero, 1987). For a brief introduction to film comedy on Francoism see David Rey, Die Franco-Ära in der medialen Geschichtskultur Spaniens: Bürgerkrieg und Diktatur im Kino und Fernsehen seit 1975, in: Jahrbuch für Europäische Geschichte 4 (2003), pp. 131-140. 9 In fact, such linguistic mistakes do not occur, although a very typical feature of Galician grammar in contrast to the Spanish one, such as the post-verbal placement of atonic pronouns, is used in the movie to highlight the Galician origin of its fictional dictator and at the same time to provide the audience with just another slapstick motif. 10 Juan Linz, Totalitäre und autoritäre Regime, Berlin 2000, pp. 113-138. 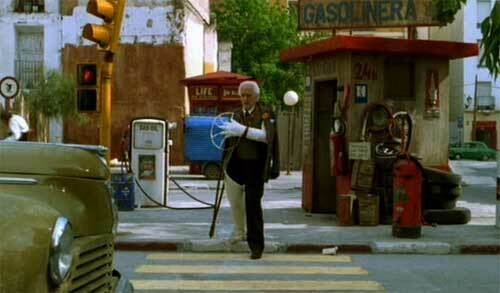 11 The character of the nostalgic Francoist, yet another stereotype in Spanish cinema, is equally present in M&F. For this purpose the movie interestingly modifies another character of Francisco Ibañez called Rompetechos, making of him an unadapted and anachronistic Francoist supporter that does not appear at all in the comic book series. 12 No doubt one of the best known poems by Antonio Machado, “El Mañana Efímero” appeared in Machado’s poetic master work Campos de Castilla, first published in 1912. It is the first verse (not the title) that is quoted here. David Rey, Laughing at the Dictator. Franco and Franco’s Spain in the Spanish Blockbuster „Mortadelo y Filemón“, in: Zeithistorische Forschungen/Studies in Contemporary History, Online-Ausgabe, 1 (2004), H. 3, URL: http://www.zeithistorische-forschungen.de/3-2004/id=4654, Druckausgabe: S. 453-461.